Our campus has grown and changed several times over its many decades at the center of Mount Washington. The several additions can make getting around a little confusing, so we want to help all of our guests find the easiest place to park and enter our complex. We have a North Lot and South Lot on N Bardstown Rd. Sunday morning parking is also available at Stout's Hardware across the street from the church. There is a gravel parking lot on Snapp St. across from the Welcome Center. The front doors of our church face N Bardstown Rd. The doors will take you directly into the foyer of our sanctuary. There is also a side entrance with an awning facing the parking lot. The nearest parking is the North Lot, which has plenty of handicapped parking, and a special row of parking reserved for guests! The Welcome Center faces Snapp St. The nearest parking lots are the North Lot and the gravel lot across the street. The most important thing to know about the Welcome Center is that this is where you can find the Check-In Desk for our childcare and children's programs. This is the ideal entrance for families with kids! 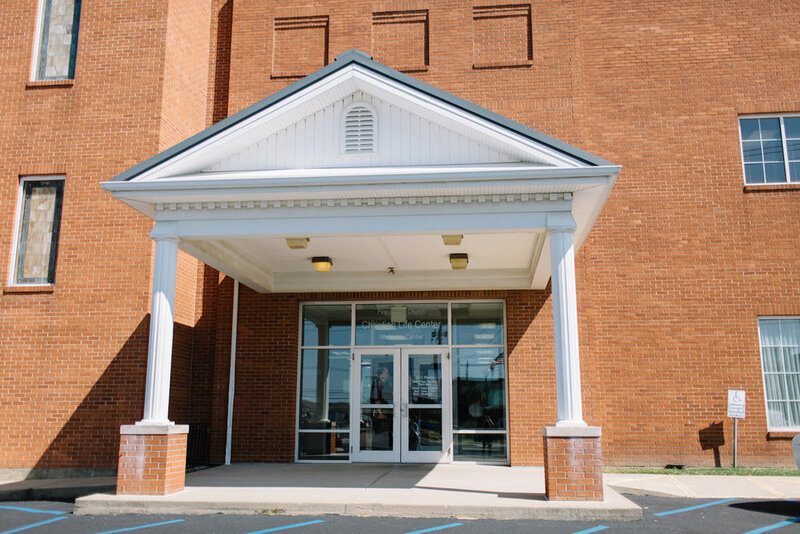 The CLC entrance will get you closest to our Dining Hall, gymnasium, and the youth room. The nearest parking lot is the South Lot.